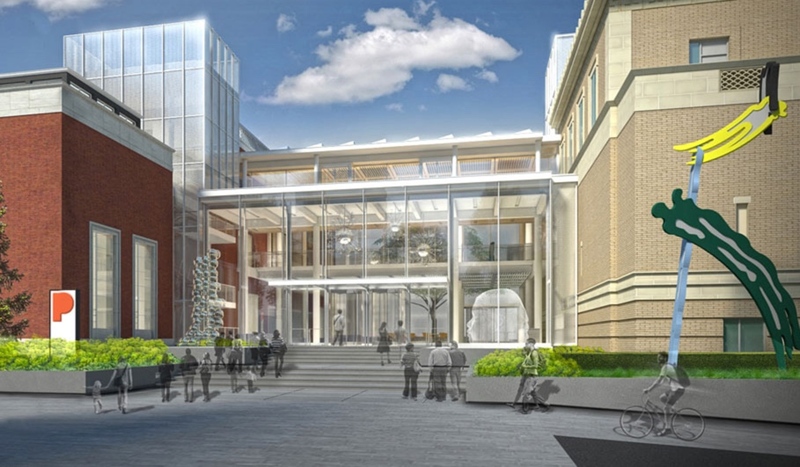 Portland Art Museum’s planned “Rothko Pavillion”. A planned expansion of the Portland Art Museum will (PAM) come at a cost of $50 million in new construction — and it would also come at the cost of public access to our city streets. 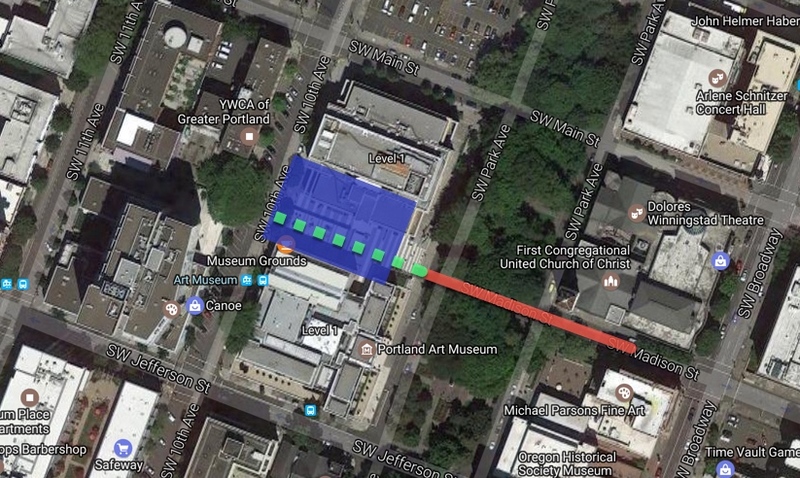 As part of their plans to build the “Rothko Pavillion,” PAM has asked the City of Portland for permission to close an existing public right-of-way through a plaza between two of their buildings that connects SW 10th and Park at Madison Street. The proposal would add a significant new structure to the museum’s footprint and it has architects and cultural backers very excited. But some advocates are concerned that the new plans will further limit walking and rolling in a part of town where street connections are invaluable. Places where it’s easy and attractive to walk and roll have small blocks with lots of connections between them. The tighter the grid, the thinking goes, the better walkability a place has. As city blocks become “superblocks,” human-powered trip times increase, which makes walking and biking less attractive. PAM’s latest plans are just the latest in a long history of limiting access to this block. Madison used to connect between 10th and Park, but at PAM’s request in 1968 City Council passed an ordinance to “vacate” the street so the museum could complete a major renovation. That ordinance held PAM to three promises: a permanent, eight-foot wide public easement would be provided; the easement should be free of obstructions and well-lit; and that the area be only used as open mall. After several incidents of vandalism in 1984, PAM requested — and was granted — an amendment to the easement to close the right-of-way between 11:00 pm and 7:00 am. Then in late 2012, PAM requested to further limit the hours of public access. They wanted the public to only be able to use the plaza during museum hours. This time however, the City of Portland’s Planning & Sustainability Commission shot down the request. According to a briefing on the issue created by PBOT Commissioner Dan Saltzman’s office, the museum than unsuccessfully appealed to former Mayor Sam Adams with a threat close public access if hours weren’t further limited. PAM’s latest request would allow them to expand their programs between two existing buildings by covering the pavilion. The enclosed space would be free to enter and is being billed by the museum as a “cultural commons” between the buildings. Existing conditions. Green line shows current easement through the block. While the new structure has many benefits for our city, the requested easement change would, according to briefing papers prepared by the City of Portland, “Potentially exclude users of the space that are not utilizing it as pedestrian access between SW 10th Avenue and SW Park Avenue, patronizing Museum offerings (e.g., gift shop, café, etc. ), or attending the Museum, as well as and/or including bicycles and animals.” Public access would also be reduced by four to eight hours per day. If the easement is approved it would make bicycle connections to and from SW Madison more difficult and inconvenient. 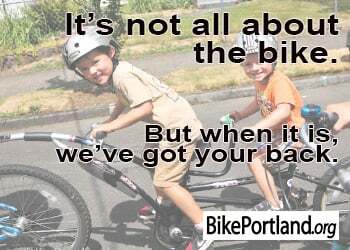 Madison is a major city bikeway east of the museum because of its relatively low-volume traffic and direct connection to the Hawthorne Bridge — the most heavily used bike route across the Willamette River with a peak-season daily average of over 6,000 trips. SW Columbia has no bike lanes and isn’t considered a bike-friendly street. Salmon would be comparable, but it would mean a four-block detour. These concerns, as well as potential impacts to walking, have already surfaced. Neighbors worry that means they won’t be able to use it for commutes or to reach places like the Arlene Schnitzer Concert Hall and the Oregon Historical Society. Ferriso [with PAM] said he recognizes the neighbors’ concerns, but whatever’s lost by closing the walkway an additional 25 to 30 hours is outweighed by the community benefits of improved educational and cultural opportunities at the museum. Wendy Rahm, an Eliot resident who is a museum patron and a member of the board of directors of the Architectural Heritage Center, worries the museum isn’t listening to stakeholders in her building. This ordinance is scheduled to be heard at City Council on April 20th. 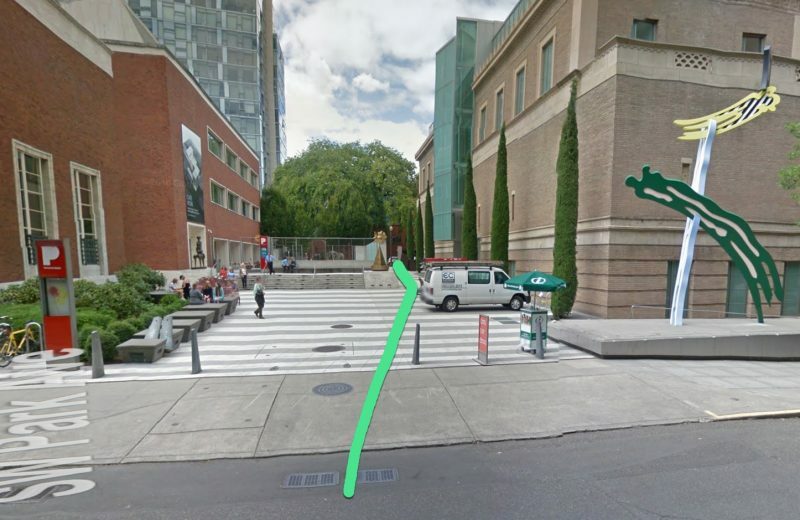 The post Museum expansion would prohibit biking, limit walking access near South Park Blocks appeared first on BikePortland.org. 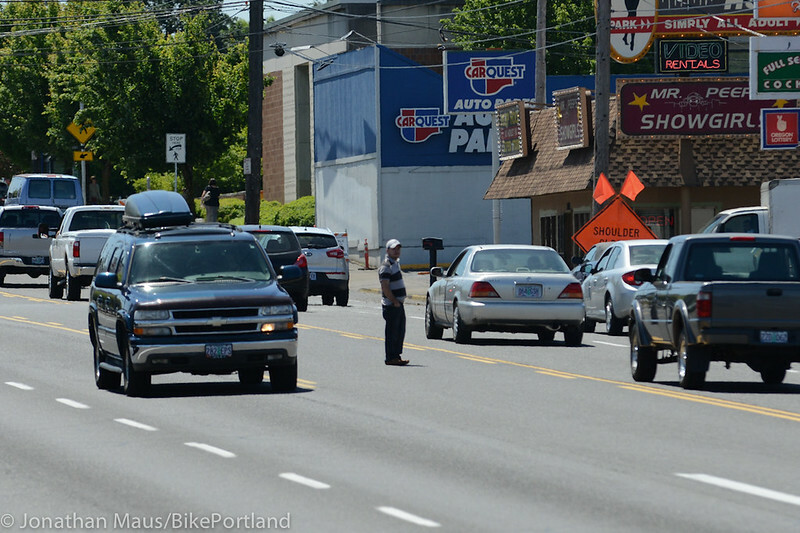 Crossing large arterials in east Portland — like 122nd — should be much easier. When it comes to moving people in Portland, “walking” is listed in our 2035 Comprehensive Plan as the highest priority mode. To make sure that policy makes it into practice, the Bureau of Transportation has embarked on the first update of their Pedestrian Plan since 1998. They call it “PedPDX”. PBOT should stop using “ped” and “pedestrian” and replace it with “walk” and “walker”. Yesterday PBOT launched a survey to recruit 15 Citizen Advisory Committee members and unveiled the plan’s new website. The plan will aim to do that by producing a project list that will guide investment, create policies that influence how projects are implemented, and help walking compete with other transportation modes as our city grows. PBOT acknowledges that a new plan is needed to address the fact that, “significant gaps and deficiencies remain” in the walking network, especially in neighborhoods far from the central city. The existing 1998 plan was created in a time long before we considered transportation equity and Vision Zero — two principles that dominate investment and policy decisions today. Portland mode priority policy in the 2035 Comprehensive Plan (adopted June 2016). This plan will likely have many intersections with bicycle use. With construction of a network of protected bikeways downtown expected to begin next year, PBOT needs clear policy guidance for how to integrate walkways into these new street designs. Another issue that’s like to come up is a design standard for separating bicycles users from people walking on popular paths like the Waterfront, Esplanade, and Willamette Greenway paths. Another major issue PBOT will address as part of this plan is street crossings — a very weak link in both our walking and biking networks. The plan will include a “pedestrian network gap analysis” where crossing gaps citywide will be quantified. A related and extremely important issue that PedPDX will tackle is parking setback standards. Whether walking or biking, many of Portland’s crosswalks would be much safer if PBOT would enforce and/or create new parking restrictions near corners. When people park too close to corners, it’s difficult for walkers and bikers to see oncoming cross-traffic. PBOT hopes to have a draft plan completed by July 2018 and council adoption by fall of that same year. Learn more and apply to be on the CAC at the PedPDX website. The post Portland launches ‘PedPDX’ to update citywide walking plan appeared first on BikePortland.org.